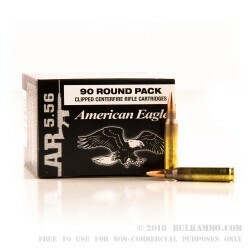 Suitable for use in AR-pattern rifles, this box of 5.56 NATO cartridges features nine reusable stripper clips loaded with 10 rounds apiece for easy loading into a variety of magazines including USGI mags and PMAGs. The cartridges, which use a typical boat-tailed 55 grain full metal jacket round, produce a muzzle velocity of 3240 feet per second. This ammo is made at the Lake City Army Ammunition Plant, a US government facility managed by Federal. 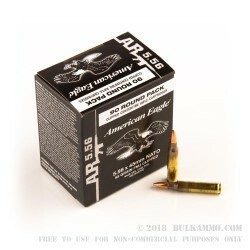 It is essentially identical to M193 “ball” ammo used by the military and is available to the public under Federal’s American Eagle brand thanks to extra production capacity. 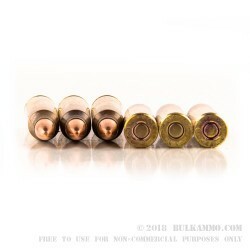 All XM193 ammo uses reusable brass cases with Boxer primers. Note that this is 5.56 NATO ammo and may not function safely in rifles chambered for .223 Remington, particularly hunting firearms. Check with your manufacturer if in doubt. Federal Premium Ammunition is a subsidiary of major defense contractor Alliant Techsystems, and produces ammo for the US military at Lake City. 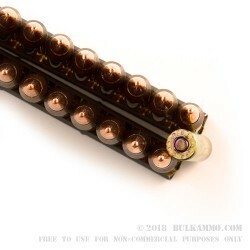 The company’s main production plant in Anoka, Minnesota has manufactured a variety of well-regarded range and self-defense ammo since the company’s founding in 1922.
this product is a great deal for the money.